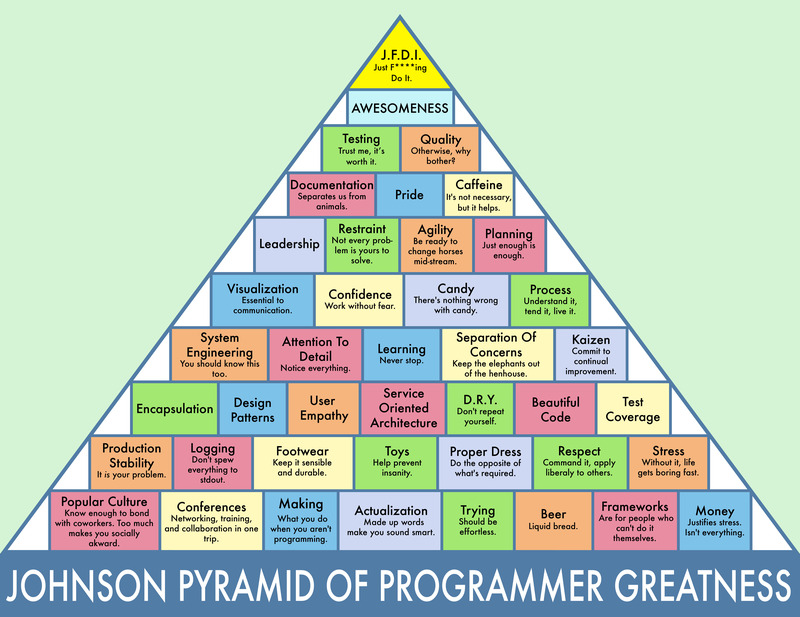 A few years ago, inspired by the TV sitcom Parks and Recreation, I fired up Adobe Illustrator and put together an infographic that highlights my personal philosophy about what makes a great software engineer, The Johnson Pyramid Of Programmer Greatness. This is the latest version. In this post, I'll talk a bit in depth about how it came about, and what it all means. Ron Swanson (Nick Offerman) and Leslie Knope (Amy Poehler), or, "what Josh's brain looks like inside". There's a TV sitcom that aired on NBC in the US from 2009-2015 called Parks and Recreation. It's filmed in the style of a documentary, like The Office, but they didn't take the format too literally. The series centers around a parks and recreation department in a fictitious town in Indiana. The main character is Leslie Knope, a deputy director who believes in government and is really upbeat and motivated. She's played by Amy Poehler. Her boss is sort of her counterpart, a self-proclaimed "libertarian" who's biggest dream is to eliminate all government spending. His name is Ron Swanson, and he's portrayed by Nick Offerman. But more so, the two characters, in a small way, represent the dichotomy of my own personality. Leslie is high energy, meticulous, and hyper-organized. She has strong, positive beliefs. I tend to be that way too. While technically a staunch realist, I tend to look at things in a positive light first, and find a lot of joy and wonder in the world. Ron is a pragmatist at heart. He's blunt, and anti-social. He's an outdoorsman. A "mans-man" but not insensitive or bigoted. He does things his own way. Yet he will share his wisdom readily. He's a craftsman, and builds beautiful things without much celebration. I identify with Ron a lot when I'm building things, or mentoring. That's me in a nutshell - optimistic and positive, bubbly, intensely excited about things I'm interested in. 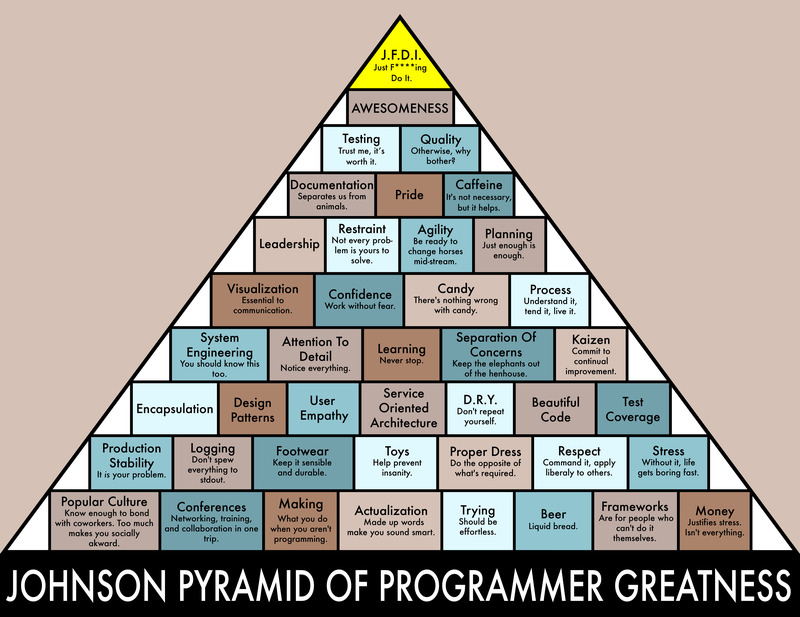 Yet I'm a quiet, matter-of-fact, pragmatic craftsman when I'm creating. Both sides of my personality work together when I'm sharing what I know, teaching, or writing documentation. There was an episode where Ron was tasked with coaching a children's basketball team. Ron decided that the best way to make true champions of his kids was to indoctrinate them with wisdom of what makes a person truly great. 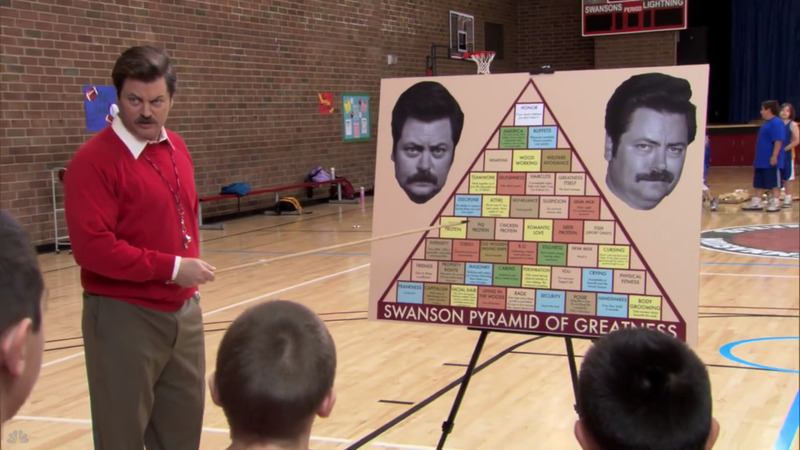 "Coach" Ron Swanson (Nick Offerman) presenting The Swanson Pyramid Of Greatness to his team. CAPITALISM God's way of determining who is smart, and who is poor. INTENSITY Give 100%. Giving 110% is impossible. Only idiots recommend that. BUFFETS Whenever available. Choose quantity over quality. It's all very tongue-in-cheek, and a ridiculous thing to push onto kids just trying to get some exercise. 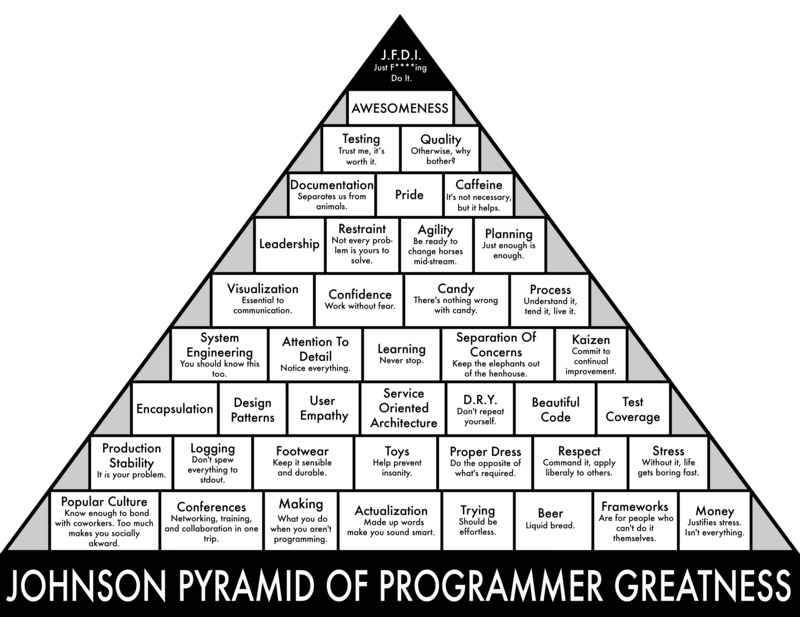 And that's what got me thinking - what sort of things would I put on such a pyramid, in a similar tongue-in-cheek style, that I might push on unsuspecting software engineers? I fired up Illustrator and got to work. My interpretation of Ron Swanson's masterpiece is probably a little more serious than his was, but it's still intended to be a light-hearted take. It was designed in Adobe Illustrator, at full 24x48" poster size. I tweaked the dimensions a little bit to accommodate printing on standard letter/A4 paper, in landscape.